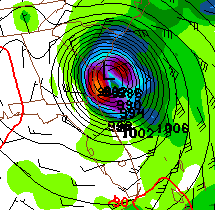 Three new and reliable computer models have come in since my last posting (which will be my last of the day on this topic) and all indicate that the Florida Atlantic coast will be brushed by Irene with the main threat shifting to Georgia and South Carolina. And, that Irene will be a major hurricane by that time. Here is my concern: It has been more than twenty years (Hugo, 1989) since the area was struck by a major hurricane. There has been a great deal of coastal development since that time along with numerous people who have never been through a hurricane before, let alone a major hurricane. So, what would I recommend to people who might be faced with the first major hurricane of their lives? Do you want to invest in a generator? If so, now is the time to make the investment and get it installed. People in that business may be swamped later in the week. Do you have hurricane shutters or plywood to board up windows? If not, now is the time. Even if Irene does not materialize (see below), you'll still have them for future storms. If you are responsible for a number of people (i.e., nursing home), do you have a plan you can execute even if all your employees are not available? Again, if not, do it now! Do you know how to disconnect an electric garage door opener? If you don't know and do not have power, how are you going to get your car out? These are the types of things to be thinking about now. Now, do I think Florida (or even the Gulf) is out of the woods? Nope. It is still too soon to say! But, because it appears Georgia - South Carolina area might be threatened, and because it has been nearly a quarter century since a major hurricane has occurred in the region -- I want people to think about their response. After all, when Hugo occurred, people as far inland as Charlotte were without power for weeks. Thank you for the correction, I'll correct the blog.